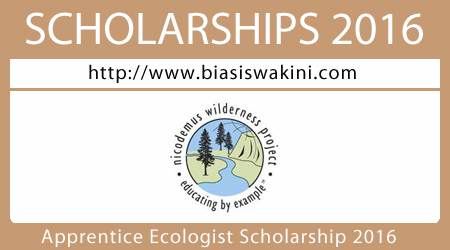 Three scholarships 2016 totaling $1,750 will be awarded annually to the authors of the three best Apprentice Ecologist essays. The top author will also receive a personalized crystal award courtesy of Crown Awards & Trophies. By registering and submitting your essay, you will automatically be considered for a scholarship. Be sure to include your full contact information (always private) when registering so that we can process any scholarships/awards that you may win. Scholarships are available to any student (ages 13 to 21) who is a candidate for a degree/diploma at a primary (middle school), secondary (high school), or accredited post-secondary (undergraduate at college or university) educational institution from any country around the world. The award covers 1) tuition and fees to enroll in or attend an accredited post-secondary (undergraduate or graduate at college or university) educational institution and/or 2) fees, books, supplies, and equipment required for courses. Applicants should embody the spirit of the Apprentice Ecologist Initiative™ by demonstrating personal leadership, initiative, and environmental stewardship in their project. Essays will be judged by a committee of Nicodemus Wilderness Project board members, volunteers, and past Apprentice Ecologist award winners. Please see tips below for additional elements that the committee considers important when judging essays. While there is no minimum/maximum length for essays, most of our past winners have written essays that ranged from about 750 to 1,500 words long. The deadline for uploading your Apprentice Ecologist project essay is midnight GMT on December 31, 2016 . Winners of the annual Apprentice Ecologist Awards will be published online on Earth Day (April 22). Note: There is a separate Apprentice Ecologist Open Space Initiative scholarship if your project benefitted any lands managed or co-managed by the City of Albuquerque’s Open Space Division. 0 Komentar untuk "Apprentice Ecologist Open Space Initiative Scholarship 2016"